The French call Ventoux 'the killer mountain' and in 1967 it claimed its most famous victim, as former world champion Tom Simpson died near the summit during that year's Tour de France. The terrible ascent of Ventoux's south side encapsulates both the brutality and beauty of this cruel sport, but also highlights cycling's ongoing battle to distance itself from its demons. Yet it was the legendary and extreme climb of Mont Ventoux that first inspired award-winning author Jeremy Whittle's love of cycling, so much so that he bought a house in its shadows. 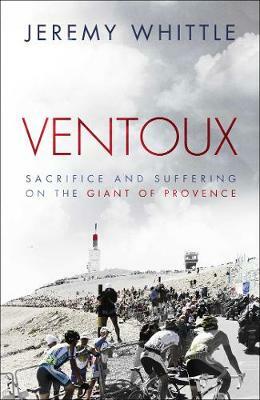 Ventoux is his memoir to the Giant of Provence in which he reveals the little-known history of the Ventoux, and tells the story of a monstrous climb that has driven riders to near-hysteria and also to wild extremes of doping. It has provided the spectacular backdrop to some of cycling's most titanic contests, exposing the true character of those who take on the challenge. Through a series of revealing conversations with Lance Armstrong, Dave Brailsford, Alastair Campbell, Nicole Cooke, Tyler Hamilton, Eddy Merckx, Simpson's daughter, Joanne, and many others, Whittle details the poignancy of bitter memories, flawed obsessions and ruthless ambition that have made the Ventoux so feared and so infamous.